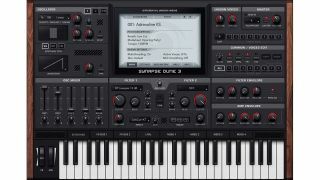 Synapse Audio’s Dune has always been an excellent plugin synth - we branded version 2 as a “modern classic” - but its profile hasn’t quite matched that of some of its contemporaries. Things might be about to change, though, with the release of Dune 3. Described as ‘Dune in full HD’, this offers multiple new features, starting with a revised filter section that now sports a multimode filter plus insert effect. There are different routing modes and new filter types, too. Elsewhere, you now get two arpeggiator units instead of just one. These can be programmed independently, support both Up/Down arps and can play back different sequences or even MIDI files. The oscillators have been improved, too, with support for VA, FM and wavetable synthesis. There’s a maximum reserve of 8320 oscillators at full polyphony, while Swarm mode is an evolution of the supersaw oscillator. Here, each oscillator gets its own modulation. In the effects section, meanwhile, you’ll find multiple new algorithms and a new EQ, while the wavetable editor offers free-hand drawing, segments, a dedicated partial editor and the option to enter formulas. Offering support for Native Instruments’ NKS format and patch-compatibility with Dune 2, Dune 3 is available now for PC and Mac in VST/AU formats priced at $179. Dune 2 owners can upgrade for $79. Find out more and download a demo on the Synapse Audio website.